This is the third in an occasional series that focuses on kiwi musicians covering kiwi songs (Links to downloads of the previous two are posted below). Kicking things off is a version of The Clean's 'Fish' from the 1997 Flying Nun Clean tribute entitled God Save the Clean. 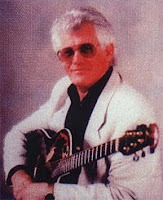 Perhaps one of the least expected artists to appear on the album was Gray Bartlett, a country musician who was often on TV in the 70s and has since moved onto tour promotion and a 12 year foray into right wing local body politics. Now he's back on the road and back into the political sphere too. Bartlett recently launched an ill-informed attack on a variety of music funding initiatives which has certainly got people talking. The new Freeview TV show Media 7 ran a debate between Bartlett, NZ On Air chief Brendan Smythe and the Real Groove editor, Duncan Grieve, which is well worth watching. You can also hear Gray Bartlett perform live on National Radio here (stream). years of music from Dunedin. I'm not sure if it's still in print but it's worth picking up second hand or try your library. From She's Lost, an internet only compilation of dark-alt/industrial/electro/experimental acts covering favourite NZ songs, comes The Fanatics with an electro version of The Gordons' post-punk guitar classic 'Adults and Children'. Cut Off Your Hands have been playing Split Enz's 'Shark Attack' live for a while now but they have just leaked a studio recording of the song as a teaser for their forthcoming album. The track can be downloaded here. In 2006, under their former name, Shaky Hands, the band performed the song live on TV. The clip can be found on the video page. Finally in this covers round up is a raucous take on the La De Da's' 1966 hit 'How Is the Air Up There?' 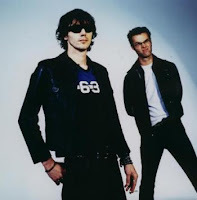 from the Hasslehoff Experiment, a late nineties outfit about three years too early for the international boom in drums and guitar blues rock duos (pictured right). They were a phenomenal live act and the good news is that there are rumours floating around of a reunion.